Every day, many thousands of commuters, locals, and tourists ride public transit in Washington, D.C. To help all of these transit riders find their way around the metro area, today we’re making comprehensive information about D.C.’s public transportation available on Google Transit. In partnership with the Washington Metropolitan Area Transit Authority (WMATA), we’re adding all of D.C.’s Metro and bus stations, stops and routes, as well as connections to other transit systems in nearby cities. You can find this information on Google Maps as well as Google Maps for mobile—no matter where you are, you can get to where you’re going. 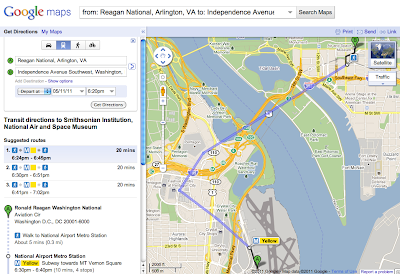 With Google Transit, D.C. metro-area commuters—including those in Baltimore, Montgomery and Jefferson counties—may discover a quicker route to work, while visitors can easily make their way from Reagan National Airport straight to the Smithsonian. Public transportation is a vital part of city infrastructure and can help alleviate congestion and reduce emissions. But planning your trip on public transit can be challenging, especially when there are multiple transit agencies and you need to use information from multiple sources to figure out the best route. 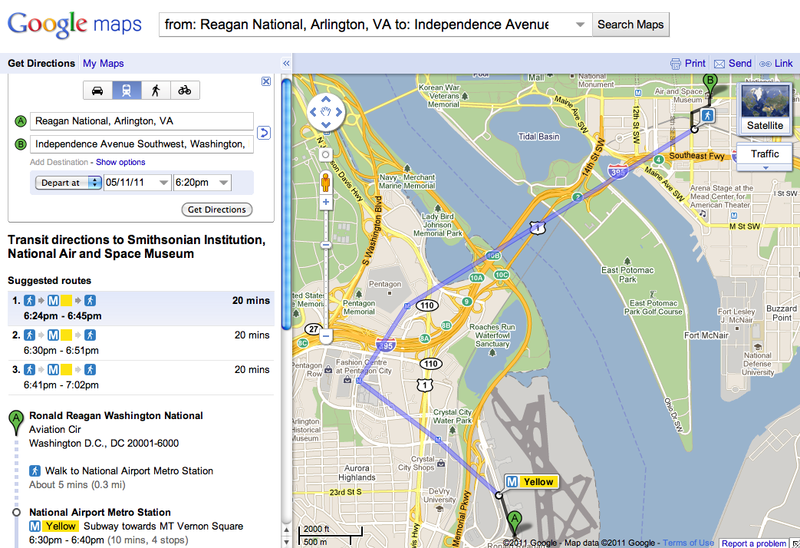 With mapping tools like the transit feature, we’re working to make that easier. Directions are also available on Google Maps for mobile—so if you’re graduating from GWU and want to meet some friends in Adams Morgan to celebrate, it’s as easy as pulling out your phone. 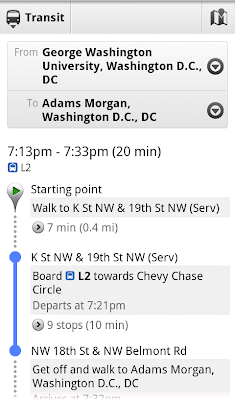 If you’re using an Android device, for example, search for [Adams Morgan] in Google Maps, click on the Places result and select “Directions.” Switch to Transit in the upper-left corner and find out which bus gets you there fastest. 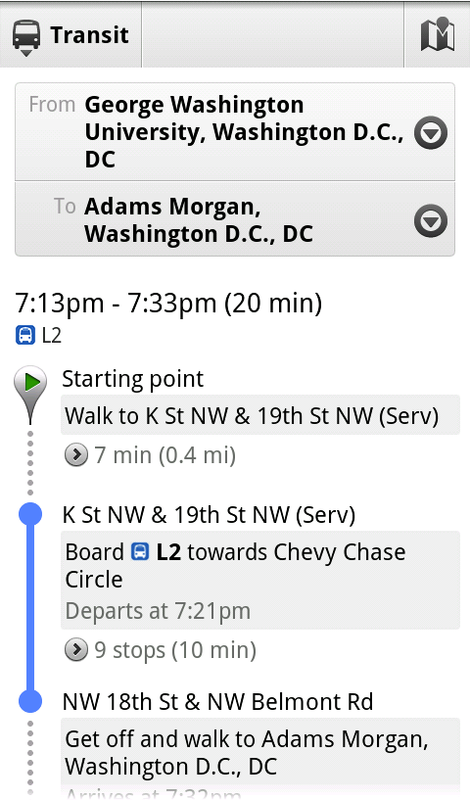 Wherever your journey takes you, whether using public transit, driving, biking or walking, we hope Google Transit directions in D.C. make finding your way a little easier.